A science student might know what it means by CERN. At least now when the recent shocking news about theexistence of particles (Neutrinos) that run faster than the light was announced by the CERN scientists. A big blow to a long-held assumption. Could bring major upheavals in the theories expounded even by Albert Einstein and the like. CERN stands for ‘European Organization for Nuclear Research’, situated in Geneva. This world largest physics lab can boast of having been run by 2400 full-time employees and 7931 scientists and engineers representing 608 universities and research facilities and 113 nationalities. The Nobel laureate and co-founder of Quantum Physics Werner Heisenberg was also one of the co-founders of this particle research centre. But believe or not, this awesome international science centre houses a huge statue of Natraja, the symbolic depiction of Lord Shiva who performs his cosmic dance to destroy the decrepit universe making way for the Lord Brahma to re-start the new creation. The statue was a gift presented by the Indian government in 2004. Strange, how a Hindu God found a place in the science centre, a seat of rationalism and reasoning? The atheist may fume at the idea. No strange, they have proclivities to shrug aside any religious symbols and rituals as a load of superstitions, --- irritant hurdles on the way to progression and liberalism in the free thinking world. But alas, their rational fathers and men of letters and intellect are now thinking hard on the other way around. They are turning towards the wisdom of India. Striving to dig deeper into the ancient archives. Yes, the modern scientists are beginning to think in the same line what Rishis in India did and put down in the series of Upanishads ages ago. 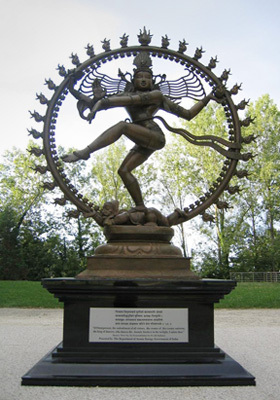 So the glorification of Natraj by the nuclear scientists in the CERN is never impertinent. Rather inspirational, providing fuel for further exploration. The thing may sound quite staggering to the skeptical but the science has long been kneeling down before the Eastern wisdom. Beware the atheist, the science is returning to Hinduism. Not the religion, but all pervasive DIVINITY.